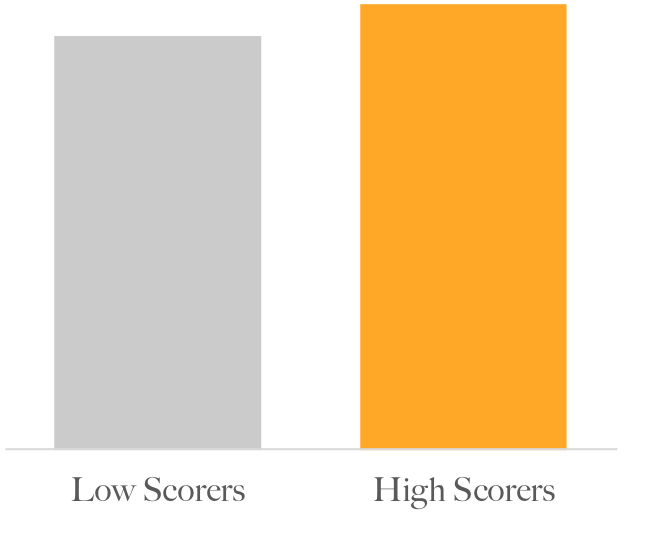 Job applicants who get high scores on our assessments make significantly more money for their companies than low scorers. We prove this by conducting validation studies with researchers at the Wharton School. Validation studies are scientific experiments that show how accurately pre-employment test scores predict job performance outcomes like sales revenue. Experts at the Wharton School who complete our validation studies hold them to the accepted scientific standard of 95% confidence, also known as statistical significance. The Optimize Hire team, along with researchers from the Wharton School, can conduct a validation study to prove how well our pre-employment tests predict sales revenue at your company. Click here to learn how. Employees at this company who earned high scores on the Optimize Hire Pre-Employment Test generated 7% more sales revenue than low scorers. This study was conducted with a Fortune 300 company in the Northeastern United States. These sales numbers from three large companies that participated in a combined validation study showed that high scorers generated 89% more sales revenue than low scorers.